Bring chicken stock to boil in a small saucepan. Turn heat down to a very gentle simmer and fully immerse chicken breasts for 15 minutes. Remove the chicken and check if it’s cooked through by slicing into the thickest part. It should no longer be pink. Let it cool a little then shred the meat by ripping it and place in a mixing bowl. Bring a small saucepan of water to boil and blanch (lightly cook) the beans for about 2-3 minutes. Remove from heat and rinse with cold water. Drain and set aside. Make the dressing by combining mustard, lemon juice and rind, olive oil, garlic, mint (save some for the garnish) and pepper. Add a little water if you need to thin it out. 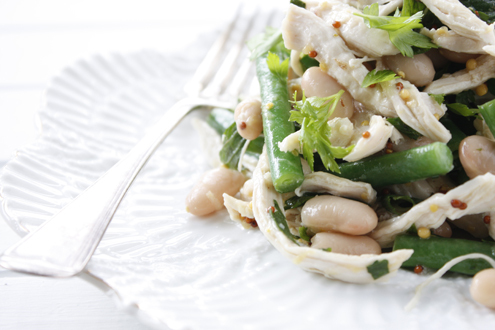 Add green beans and white beans to the shredded chicken. Pour over dressing and toss well. Serve garnished with a little mint or parsley if you have some.